Blackfeet military veteran and spiritual advisor Roger Vielle during sweat ceremony for Vietnam veterans on the Blackfeet Reservation, Montana, September 2017. Courtesy: Wingspan Media Productions. Michael Carroll served 18 months in Iraq for the United States Army. After coming home in 2004, doctors found that he suffered from Post Traumatic Stress Disorder (PTSD). Mental health experts say the disorder develops in some people who have experienced a shocking or dangerous event. Such persons may feel frightened even when they are not in danger. They also can suffer from depression for months or even years after the event. Michael Carroll left the army after receiving an honorable discharge. He described the change to civilian life as difficult, and that he was quick to express anger. Carroll told VOA “Anything could trigger me, sounds to smells to seeing trash on the side of the road." The unwanted waste made him remember explosive devices used against coalition soldiers in the Iraq war. Over the next few years, he received the usual treatment for PTSD, which included medication and meetings with mental health experts. He said this did him more harm than good. In 2009, while being treated at the Spokane Veterans Center, Carroll heard about an outdoor recreational retreat for military veterans like him. The retreat was organized and financed by a group of Spokane Valley firefighters. Iraq War veteran Michael Carroll, assisting in building the frame for a sweat lodge under the direction of Blackfeet Indian cultural advisors. Courtesy: Michael Carroll. Since ancient times, Native American and Alaskan Natives have shown great respect to warriors. The native people have developed prayers, ceremonies and traditions to honor returning soldiers and ease their way back into the community. One of the most common is a traditional steam bath, known as a "sweat." This tradition is believed to have started with the Plains Indians. 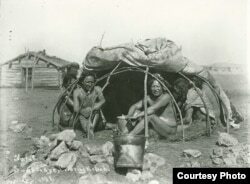 It is now practiced, in different forms, by many American tribes. The U.S. Veterans Administration has recognized the value of sweats to Native service members. Since the 1990s, the government has permitted tribes to hold sweats at several VA medical centers across the country. 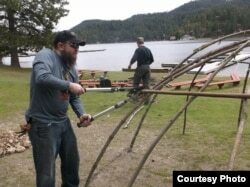 Now, non-Native veterans have started the tradition. Darrin Coldiron is a Spokane firefighter and president of Veterans Community Response (VCR), an all-volunteer group that holds several gatherings a year. Coldiron told VOA that he learned about the importance of native traditions in college. He said "I learned that in so many societies, when you send a warrior off, there's a ceremony, and you bring them home with ceremony." Craig Falcon, a member of the Blackfeet tribe who leads ceremonies at VCR retreats, explained how the sweat has been used in his culture to help warriors returning to civilian life. "You come back from war with things attached to you," he said. "And some of those things may not be good. They could be memories. Or it could be somebody you killed, and that person attaches himself to you and comes home with you. Ceremonies help wash those things off, send them back to where they came from and get you back to who you are." Roger Vielle, another member of the Blackfeet tribe, has served on VCR's board as spiritual adviser since 2009. At first, he was not sure how non-Natives would like the sweat. 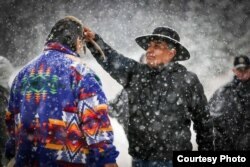 Photo shows cultural advisor Craig Falcon (R) blessing Roger Vielle, both members of Blackfeet tribe, during a Vietnam veterans retreat on the Blackfeet Reservation in Montana, September 2017. Courtesy, Wingspan Media Productions. ​Vielle said, "Some of the stories they share afterward and some of the things that have happened to them during the sweat are like — 'He struggled to find words. They say something happens there. They've gotten in touch with something.' And I tell them, I'm not the one doing it... You did the work, you did the prayers." VCR retreats are financed entirely by donations and cost the participants nothing. The reason: no true tribal healer would ever charge money for a ceremony. Michael Carroll said he was unsure, and even a little frightened, of his first sweat. But he added that after you go inside the sweat center, and the music begins, the experience was good. "Then you pray, and you begin to feel the toxins pour out of your body,” he said. “And a lot of time, there's a sense of another presence, something… besides you and the other people gathered there." Vielle and Falcon were unwilling to share too many details about the ceremonies, which are important to their culture. Falcon added that some non-natives are taking traditional ceremonies and the tribal way of life and trying to sell the experience to others. He said some veterans come out of sweats wanting to build centers outside their own homes. "I tell them, I can't stop you if you want to go and build one. But it won't be done in the right way,''' Falcon said. "And once I tell them that, they are very respectful and say, I'll build a sauna instead.'" Cecily Hilleary reported this story for VOANews.com. Phil Dierking adapted her report for Learning English. George Grow was the editor. Have you heard of other forms of treatment for people suffering from PTSD? We want to hear from you. Write to us in the Comments Section.